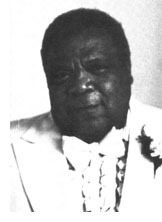 Clarence Faucett's unselfish and dedicated work with the youth of Peoria was brought to a regretful close when he collapsed and died at the parking lot of a store at University and Forrest Hill on August 17, 1981. But throughout his lifetime he had done much ... he had accomplished his objective of helping thousands of kids -. black, white, Protestant and Catholic. His heart of gold and his sincere interest in youth caused him to be a father figure to all the kids he coached and helped. Clarence organized and directed the Sports Club, the Silver Club for youth sports activities. He worked at the Salvation Army, Carver Center and was involved in kid's summer programs. He coached at St. Boniface, Trewyn and St. Philomena grade schools, as well as the Little Leagues and Journal Star baseball program. He was a great influence to the boys at Manual, Woodruff, Central and Spalding and could be seen at these schools' games watching and encouraging "his" boys. In 1963 Faucett was one of the two people to share the Brotherhood Award, and in 1980 he was honored at a testimonial dinner which was attended by coaches in the area, by children, adults and civic leaders. Mrs. Germaine Faucett, his wife, will proudly accept his Neve Harms Meritorious Service To Sports Award. John guided the Richwoods High School girls basketball team to a 38-0 season that concluded last March with the Class AA state championship. Gross, who won 544 games in 26 seasons at Limestone, was in his first season at Richwoods.